It’s been outstanding for a while. Lingmell fell, in the Southern Lakeland Fells, is one that I usually pass by on the way to or from Scafell Pike. So on my list it stood out as the last of the higher fells to be completed. Today, I made it an objective in itself, to make sure my Wainwright tick list was clean. And now number 141 is now done. I took the impressive path alongside Piers Gill, spectacular rock views into the great ravine. 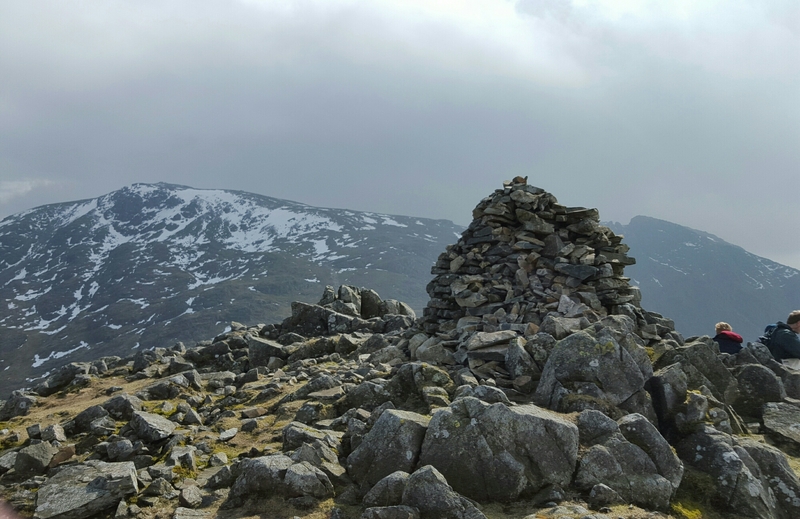 The day was warm and sunny in the valley, but as height was gained, mountain cloud started to close in, mainly around the summit of Scafell Pike. After Lingmell was ticked off I joined the crowds on the pike. It was difficult to stop myself from giving out help and advice, particularly to those in jeans, tee-shirts and trainers struggling through the snow patches near the summit. One guy did ask for directions down, which was good as I explained the difference between green dashed (RoW) lines on the map and real paths that existed on the ground. He headed of down the way I had come up. From the summit it was misty enough to take a bearing to Mickledore, I didn’t want to end up with the crowds heading back down via Hollow Stones. The path from Mickledore down involved a steep scree gully, more eroded that the last time I was here. On arrive at the car park, the rest of the party had arrived and were waiting in Ritsons bar for me. Great timing. That was a good day out. Was amused by the crowds on the Pike – did you check their whistles and torches. I had a decent view of Scafell Crag from the lowly Ponsonby Fell the same day. There is a favourite painting of mist swirling round Lingmell on the wall behind me! Have an even better story to share from today. A group of 4 arrived in Honister Hostel this morning, clad in leather jackets, jeans and trainers. They had parked at Seathwaite and wanted to climb Scafell Pike. I can’t work out how they got to Honister. I think I’ll make this todays blog! This entry was posted on April 4, 2016 by antondotreks in Blog.